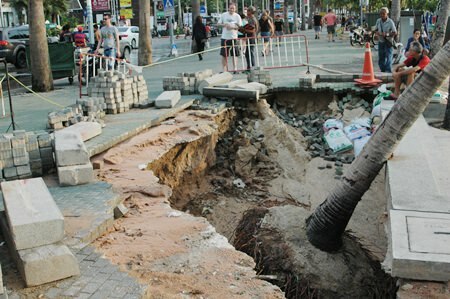 Recent tropical storms have left many areas of Pattaya in tatters. 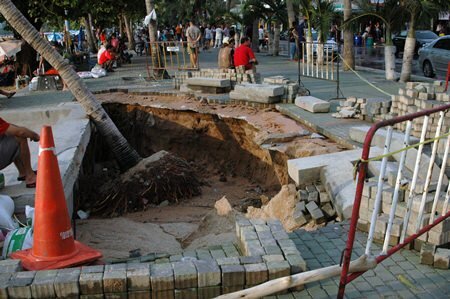 Tilted trees, sand erosion and holes were spotted in tourist areas April 16, causing potential danger to pedestrians. City workers have been working to keep up with the damage, but can’t prevent it entirely from happening again. 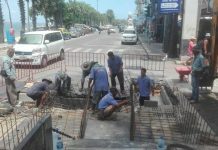 Songkran and the crush of tourists it brought made it difficult for the city to do any serious infrastructure work. Contractors are being pressed to complete work as soon as possible. Flood waters washed away support for this recently planted tree along the Beach Road promenade.